One of the most stressful aspects about finishing your time on the JET Programme is finding a job whether it be in Japan, back in your home country or another country altogether. This post will be focusing on finding a job in Japan for JETs . The majority of this information is sourced from job hunting seminars provided by WA.SA.BI / MoriKoSan for foreigners (students and JETs) in Japan. While there are many articles about job hunting in Japan there are few which are actually tailored towards JETs. Hence, we highly encourage JETs to pay attention to posts by their Alumni networks/groups about seminars as they are hard to come by. Soon there will be many career fairs across Japan. If you’re only just starting to prepare for them now in February you may find yourself slightly behind when compared to some of your peers at the fairs. This image was taken at a Job Hunting Seminar December 2018. The optimal time to start preparation for job hunting in Japan is actually around late November to late February. 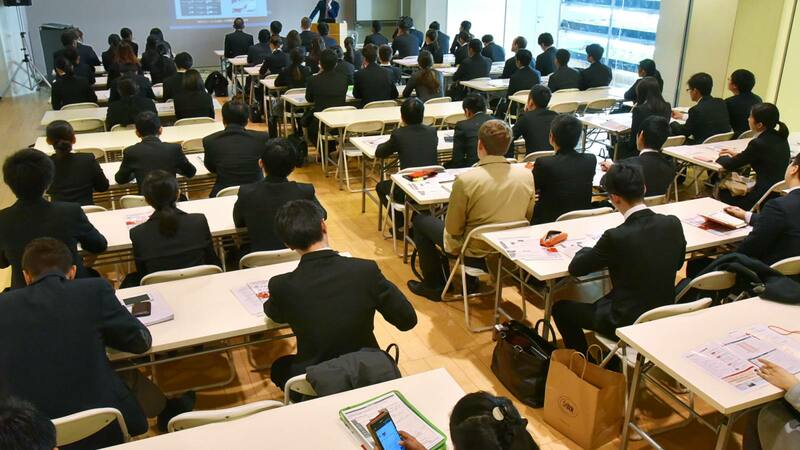 During this time there are various job hunting seminars for students in Japan, there are also some for foreigners too. December to January – Job information sessions are run. Late February to late March – usually when the job hunting fairs are run. There are also information sessions with larger companies being conducted. Late March to late May – the time when you prepare for your interviews. From Late May / June onward – interviews are held. September/October – Job offers typically come out. April (the next year) – the time you will be asked to enter the company. So altogether the job hunting process is actually a 3 year process! You may think “this chart is directed to students, I’m not a student – I’m a JET” but this is not a productive mindset to have. At these career fairs you will not only be competing with fellow JETs, you will be competing with many foreign students who are currently studying in Japan too. Moreover, in the long run, you will also be competing with Japanese nationals who are more/less following this timeline too. Competition is competition , don’t forget that. The later your start preparing the more you’ll fall behind. Another thought you might have is “the time to enter a company is April but the JET contract starts/finishes in July – I don’t want to break contract” . From anecdotal evidence delivered through the seminar , there are companies who are willing to wait until you finish your contract in July and are understanding about such type of JET-esque contracts. So where to start? The first steps in applying for a job anywhere in the world is building up your resume. As many posts on the internet tell you, the Japanese resume is very different to resumes in the west. Many will say that compared to writing up a resume in the USA/Australia/UK etc it is easier to write up a resume in Japan because it is “more straightforward”. Yes, there is a general standard template that the majority follow, but, there are various little details often overlooked by JETs who follow these guides. We cannot go into detail about the specific details often overlooked but here are some points to consider. It is also highly recommended you have several copies of your resume ready with you at the the career fairs. Should your resume be handwritten or typed? – The answer : it depends on the industry . You may think a handwritten resume is out of date practice but many companies still follow this practice. It is important to research about the industry you are applying to. Which parts of the resume need to be in Hiragana / Kana/ Kanji. The way you write your address and contact details. The size and layout of your resume – Can you benefit from an A3 resume? Can you benefit from a double sided resume? Or should you just stick to the standard A4 ? The way your write your educational background and experience. Should any of your diplomas be translated into English/Japanese? Is the JLPT the really best indicator of Japanese ability in Japan? Do employers know about other Japanese proficiency tests in Japan? – Many assoicate the JLPT as the ultimate indicator to a company about your Japanese ability . There is however another test that employers are aware of is the BJT – The Business Japanese Proficiency test. It is said those who are able to receive a high level/score on this test may get perks (salary benefits) within a company. It can also assist in attaining a highly skilled professional visa. If you attend a WA.SA.BI / Mori KoSan seminar you may be able to receive a discount code for this test. If you have passed a Japanese Proficiency test how do you display it on the resume so that employers can understand it? SPI Aptitude test – many companies will use this test as part of the recruitment process. Make sure to familiarize yourself with what the test involves , you can read about it here. While there are many JETs who want to continue teaching in Japan as their career route there are many who would like to enter a new area. Sometimes the “new area” may be completely different to what they had studied in university. In short, having what your majored in match your job content will assist you very much. If you want to continue teaching as your career pathway your Visa process would definitely be smoother. *As long as your employer is willing to sponsor your Instructor Visa and assist you with any documentation you would need. If you want to enter a new field and have actually previously attained a diploma in that area your process may also be smooth, as long as you can display your credentials properly and your employer is willing to sponsor a different visa for your like “PR” or “highly skilled professional” or “Engineer – Specialist in Humanities- International Services Visa” and assist you with any documentation you would need. Remember you must send a notification to immigration that you want to change your visa within 140 days. If you want to enter a new career field but have no previous diploma in that area your process may be a bit difficult . As long as you can prove to your employer you have skills that will benefit them i.e if you’re using your lingual skills (English/Other and Japanese) you may be okay. If not then it will be difficult and it highly recommended you ask around i,e at Alumni groups and Seminars about what steps you should take. Perhaps the most important type of Visa you can get prior to getting permanent residency is the Highly Skilled Professional Visa . There are many benefits you can get from this visa such as being able to do various jobs related to other visas, it is valid for 5 years, your spouse can work too and in general, immigration and visa procedures go faster too. Within various JET Facebook groups I often see a question pop up “Should I only go to one area’s career fair or should I go to various locations?” The answer is it is largely up to you and your personal arrangements and desires. It is likely that Tokyo companies will make an appearance in Osaka and Fukuoka and vice versa (Osaka companies will appear in Tokyo and Fukuoka). So, maybe you don’t really need to go to more than one location. Tokyo does have more companies but are those companies involved in an industry you are interested in? It is important to look up which companies are present at each career fair. It was also said that going to various locations may improve your chances because employer groups may take note of it. While this may seem a lot of information to take in this is only a brief summary of what was said at a job hunting / career seminar hosted by WA.SA.BI / Mori KoSan so we would once again stress the importance of attending such seminars. These seminars are not free, they cost around 3000yen but you will most definitely attain a wealth load of information. These seminars are typically posted on the JETAA Western Japan Facebook group. It should also be said that these types of seminars are not only useful for people on their final year of JET, there were people who were on their 1st year of JET there. The earlier you start learning about the process the better. These types of events are also very useful in terms of networking a skill that will assist you anywhere.